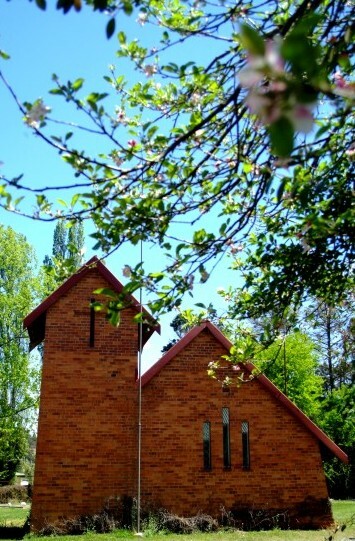 Like most of the Anglican Churches in rural Natal, the Church of St George owes its foundation to the enthusiasm and generosity of the local farming community. However, St George’s had a rather different history from the others which were all built in record time once the decision to have a church was made. It’s origins go back to 1906 when Col Bede Crompton’s mother, by all reports a staunch Anglican from England, launched a trust fund to collect the money needed to erect a church. The Colonel’s wife also left a legacy. Others donated gifts but for some strange reason the construction never got off the ground, and the trust lay idle for 40 years collecting interest. In 1945, when capital and interest had reached over 800 pounds sterling, the idea of a church was resurrected and a local property developer donated suitable ground while the new generation of parishioners reactivated the trust fund and raised sufficient funds to begin building. Construction was given impetus when a young boy Georgie Lang, son of the local postmistress, died in 1948 and had to be buried in faraway Kamberg because no local cemetery was available. St George’s was consecrated in 1949 by the Lord Bishop of Natal Leonard Noel Fisher. A quaint little red-brick church with bell tower, the original building had a thatch roof but this was later replaced by tiles.